CD-adapco announced the date and location for their STAR Global Conference 2013. The event will be held 18-20 March 2013 in Orlando, Florida. The first two days will consist of the general conference program and the third day will be devoted to training in best practices. The call for papers is open with abstracts due by 1 December. The dates of the STAR Global Conference should sound familiar. They overlap those of the Pointwise User Group Meeting 2013 that we announced back in July. The Pointwise UGM will be held 19-20 March 2013 in Fort Worth with the first day devoted to training on the latest meshing technology and the second day is for the general conference program. The Call for Papers was recently announced with a due date for abstracts of 15 November. 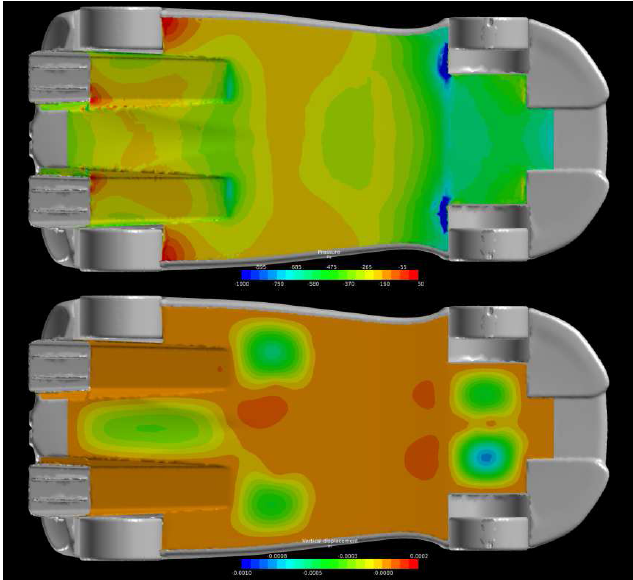 Pressure (top) and deformation (bottom) of an automotive underbody FSI simulation done with AcuSolve and RADIOSS. Image from Altair. Airloads.net is a “free download site in the hope it will be useful.” You be the judge. FlowKit is offering training on Palabos, an open source CFD code, on 12-14 Sep and 31 Oct – 2 Nov 2012. The 1st Symposium on OpenFOAM in Wind Energy will be held 20-21 March 2013 in Oldenburg, Germany. It has been announced that the 8th OpenFOAM Workshop will be held in June 2013 on Jeju Island in South Korea. Applied Math Modeling released Coolsim 4 for CFD simulations of data center cooling. Altair has started a new [and interesting] campaign – AcuSolve, not just another CFD solver. See www.altair.com/really. LEAP Australia posted 10 key points from their webinar on ANSYS CFD Meshing Tips and Tricks. Symscape posted a video of a dam break simulation done with Caedium v4. CEI is seeking your best snippets of text expansion to use with EnSight on Mac OS X Mountain Lion. This entry was posted in Applications, Events, News, People & Places and tagged AeroDynamic Solutions, ANSYS, Caedium, CD-adapco, CEI, Coolsim, EnSight, FlowKit, OpenFOAM, Palabos, Pointwise, Symscape. Bookmark the permalink.